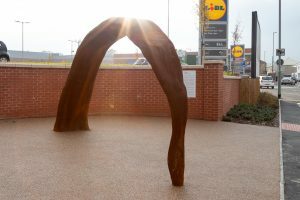 A site-specific artwork commissioned for Stanningley by Lidl and Councillors for Bramley and Stanningley to celebrate the opening of Belgrave Retail Park. The artwork is cast from iron and follows the arc of a bridge reaching out towards the street. The title of the work, ‘Bridge’, refers to the rich heritage of iron founding and bridge building that was prevalent on this site during the 19th and 20th centuries; its form the pouring of molten iron from the ladle into the mould during the casting process. In the 1870s Matthew Pitts and Thomas Binner established Albion Iron Works on the eastern side of this site (next to Grangefield Road). Despite the partnership dissolving in 1878, Matthew Pitts continued to operate on this site specialising in the construction of bridges, virtually until his death in 1896. 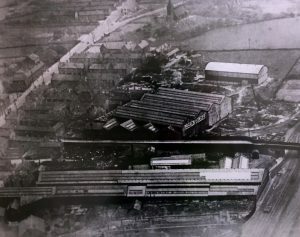 The firm’s location next to the Great Northern Railway enabled raw materials to reach the works and products to be moved to their markets by rail. Figure 1: Map from 1906 showing Stanningley Iron Works to the north of Town Street and Albion Iron Works to the south. The red line denotes the current Belgrave Retail Park boundary. Courtesy of Alan Godfrey Maps. Access to a railway became crucial to the success of many manufacturing businesses during the 19th century. John Butler’s Stanningley Iron Works was based on the northern side of Town Street and built bridges and frames for Victorian railway stations, which were sold throughout the UK and abroad (see figure 2). Butler’s was established before the railway reached Stanningley. 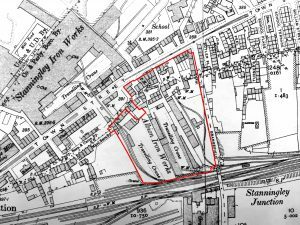 Therefore he later purchased land on the western part of the present retail park in order to build a private railway line that connected his foundry to the main line. The siding crossed Town Street and some Stanningley residents still remember a man with a flag stopping traffic when a train was due (see figure 3). 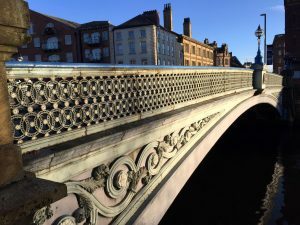 Figure 2: Ornate ironwork on Leeds Bridge by John Butler & Co Ltd. 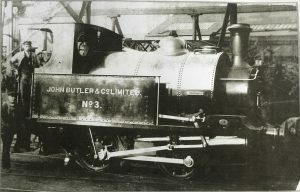 Figure 3: John Butler’s engine around 1910-11 which connected the main railway line to his ironworks by running over Town Street. Courtesy of Audrey and Alan Tate. In 1904, Albion Iron Works was purchased by Samuel Butler (one of John’s sons). Samuel and other members of the Butler family built and repaired bridges on this site until 1961 (see figure 4). Figure 4: Aerial view of the retail park from 1920. Town Street can be seen to the top left of the photo and Grangefield Road running across the middle. The large shed in the foreground is Albion Iron Works from which Samuel Butler operated his foundry and you can just see John Butler’s siding at the bottom of the picture. Courtesy of Winder Power. During this time, Stanningley was a bustling place with over 50 shops along Town Street. Major industries such as weaving and iron founding employed large numbers of local people and families who lived cheek-by-jowl with the mills and foundries. Much of this community was swept away in the slum clearances of the 1960s and its demise was compounded by the loss of the passenger station in 1967. However, old times in Stanningley are remembered fondly by those local residents who have remained in the area, some of whom have lived here for over 50 years. In 1961, the current site became vacant. It was bought by Winders, a power and distribution company who relocated here from Cross Belgrave Street in Leeds city centre in 1963. They brought the Belgrave name with them and operated here until 2008 when they moved to Grangefield Industrial Estate. This site was then vacant until Lidl bought it. ‘Bridge’ was made using the same techniques and materials as the foundries would have done on this site up to 150 years ago. It acts as a bridge between the past and the present, a reminder of Stanningley’s glorious manufacturing past and a link to its new servicing future. With special thanks to Anthony Silson and the people of Stanningley. I’ve also set up a Facebook group called Stanningley Now And Then for residents past and present to share their memories and photos of Stanningley.